This exhibition introduces the fascinating world of minerals and rocks, how they form and how they are being used in our daily life. The display exhibits a great variety of different minerals and rocks from all over the world which are part of a comprehensive mineral and rock collection donated by Dr. Stephen Hui. 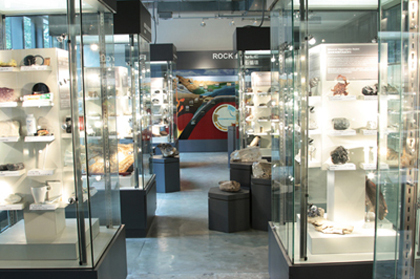 A systematic mineral collection, a gemstone collection and rock cycle display are the principal exhibits in the Earth Material gallery. One also can experience how fluorescent minerals in ordinary-looking rocks become more glamorous under ultra-violet light in the dark setting of our Museum’s small theater.